The Campagnolo Bullet is an exciting option with plenty of features that make it a must-have wheelset. From structure to balance, this is the wheelset that will make all the difference to your bike as well as your riding style. With Campagnolo, you are always expecting big things. This is mostly because the company has a habit of following through and giving riders precisely what they are asking for. This is one of the reasons that the Campagnolo Bullet was such a hotly anticipated wheelset. From the moment that we got to see them, we knew that we were right to be excited. One thing that we were especially happy to see was the integrated coupling system between the carbon structure and the aluminum rim. That, as well as the Momag (mounting magnet) system, was a welcome sight. This cuts down on the weight of the wheelset while increasing the resistance of the wheel. All that was left to do was to take them out for a spin. The Bullet has definitely earned its name as we managed to pick up speed almost immediately after setting off. The wheels needed only a gently coaxing to take on some serious hustle. Here is where the carbon construction comes into play. It has been laid up in such a way that it promotes rigidity and balance. Therefore, even when you are going really fast, you don’t have to worry about losing control. There is absolutely no wobble. 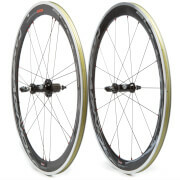 Now, Campagnolo is known for producing some pricey wheelsets. This is why the Bullet is such a nice departure in terms of cost. They tend to cost a lot less than some other models but still maintain excellent features. If you are looking for the best but are restricted by price, then the Campagnolo Bullet should be your ultimate choice. It boasts a great construction that is lightweight and rigid. It provides you with the speed you need while maintaining stability.